The deadliest terror attack in Syria in the last two years just rocked a city in southern Syria, yet few in the West will likely ever hear of it even as the reported death toll soared late in the day to over 215 civilians killed, with over 180 more wounded. The Eiffel Tower won't be lit up with colors of the Syrian flag in memory of victims, nor will viral #neverforget hashtags make the rounds on social media — and we don't expect too many official condolences issued from European or Western political leaders, as has happened with terror attacks that hit the Western world over recent years (though to its credit the US State Department tonight belatedly condemned the "barbaric ISIS-claimed attacks that took place"). This in spite of the fact that as ISIS is on its last legs in the tiny southwest pocket of southwest Syria adjacent to the Israeli-occupied Golan and the Jordanian border, and as Syrian and Russian jets continue to pound Islamic State positions, "whole families were butchered, scores of on the spot executions, children, women & elderly killed in their homes, another dark day for Syria," in the description of Syrian-British reporter Danny Makki. 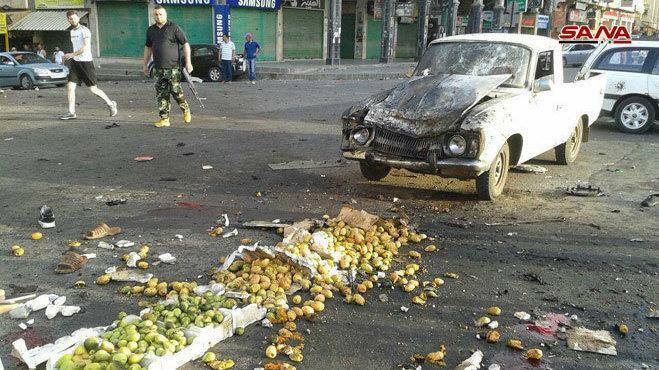 Early Wednesday morning four suicide bombers stuck a popular open-air market and other locations in Sweida city, a provincial capital in the country's south. Syrian state media said a motorcycle bomber detonated himself in the marketplace just after dawn, after which a series of other ISIS attacks followed. Islamic State media channels quickly claimed responsibility for the massacre, even as the Syrian Army continues to advance against ISIS and other al-Qaeda terrorists in Daraa and Quneitra provinces, where the particular ISIS group near the Israeli border goes by the name of Jaish Khaled Bin al-Waleed. Syrian State media reports that authorities thwarted other potential attacks and "hunted down two terrorist suicide bombers who had been wearing explosive belts and killed them before they were able to blow themselves up in the residential areas in the city." The chaotic aftermath, reportedly with bodies strewn about the crowded marketplace, made casualty counts hard to come by, as initially Reuters counted 50 among the dead, but late in the day reported 215 killed and 180 injured, including 75 ISIS fighters. Some of the terrorists involved in the coordinated attacks and who apparently survived the initial attacks were reportedly rounded up by mobs of angry Sweida residents and hung in front of a public building. Journalist Danny Makki, reporting from on the ground in southern Syria, observed "ISIS isn't finished, its nowhere near finished, it managed to kill over 150 people in one of Syria's safest provinces in one day." 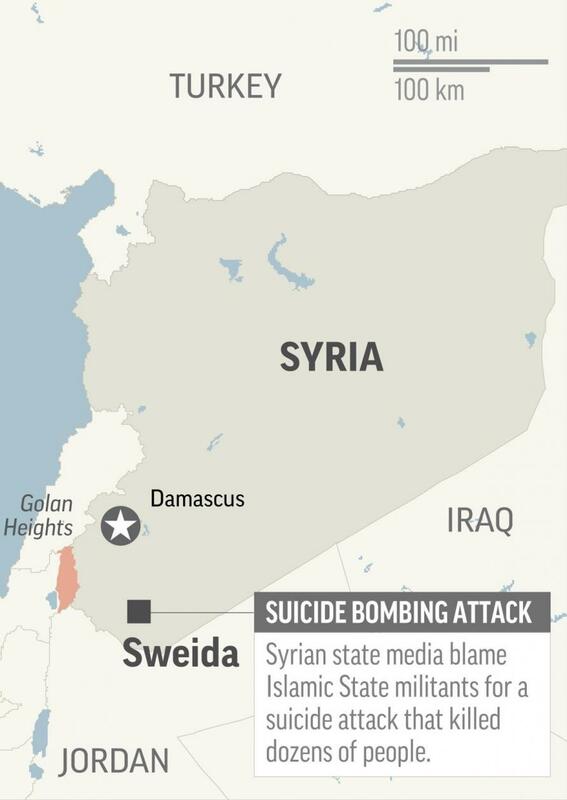 As ISIS continues to go underground while facing defeat under Syrian and Russian bombardment, many more such suicide attacks are likely to continue.